The night between Wednesday and Thursday the house of Abu Jamil got raided by the Israeli military. 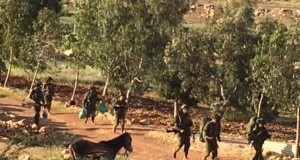 At one AM four military jeeps arrived to upper Fasayel and about 20 Israeli armed soldiers entered Abu Jamils house, forcing the family of 9 outside and started searching the three rooms. The soldiers showed no documents of a search warrant. 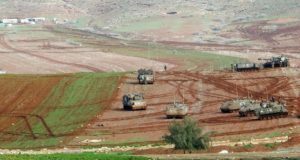 After one and a half hour the military had destroyed food in the kitchen, stolen two kilos of farming chemicals (value of 200 NIS) and stolen the six mobile phones (value of 4000 NIS) that the family had. They then kidnapped the 22-year old son Jamil who is still in Salem military base awaiting a court hearing. Together with another young man from the village, the 25-year old Ishteyan, he is accused of having broken into the illegal settlement of Tomar stealing farming chemicals. Recently another young man have been arrested and accused for the same break in. He was released after several days since he was falsely accused. The family of Abu Jamil does not have enough money to afford a lawyer for their son. Jordan Valley Solidarity and International Solidarity Movement will work for supporting the court process. 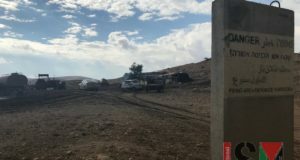 In total, 95% of the land in the Jordan Valley is off-limits to Palestinians: 50% is controlled by Israel’s illegal settlements, and the other 45% is military bases, ‘closed military zones’ and ‘nature reserves’ (areas controlled by the occupation, that Palestinians are refused access to). This matrix of oppression suffocates Palestinian life in the Valley and stifles traditional forms of subsistence farming and grazing undertaken by the Bedouin throughout history.